Meatloaf is a traditional American comfort food, often times made with a mixture of ground beef, pork and veal. But for a different twist, I decided to make a meatloaf with ground chicken instead. My inspiration was the ever popular Chicken Parmesan. Using ground chicken, I made this Chicken Parmesan Meatloaf in the Instant Pot and it has now become the favorite meatloaf recipe at our house! My husband isn't much of a meatloaf fan. His previous experience with meatloaf growing up weren't very good and he tries to eat beef sparingly anyway. So when I had some ground chicken to work with, I figured I'd try making a chicken meatloaf in hopes I could open his mind to meatloaf again. It's a good thing I did! I was inspired by Chicken Parmesan - chicken, Italian spices, Parmesan cheese... how could this combination go wrong? I seasoned the ground chicken with a few dry spices, added some shredded cheese and formed it into a loaf. Before baking, I topped it with a homemade tomato sauce. Just before serving, I topped the meatloaf with a blend of shredded Italian cheeses and baked it again until the cheese melted. It was delicious and probably a lot easier to make than chicken Parmesan itself! This dish went especially well with Scalloped Tomatoes. 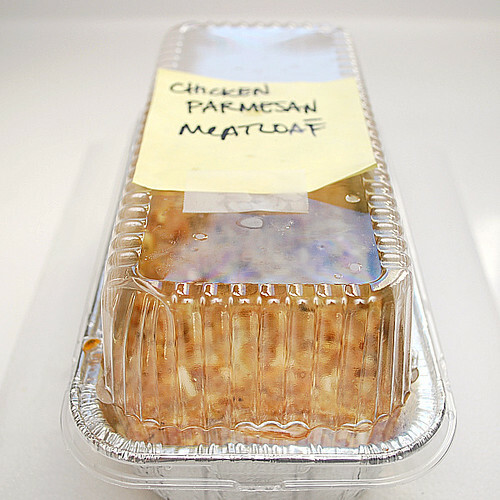 If you're looking for a new meatloaf recipe to try, this may be one to consider! If you don't have an Instant Pot, you can check out my traditional cooking version here along with freezer meal directions! 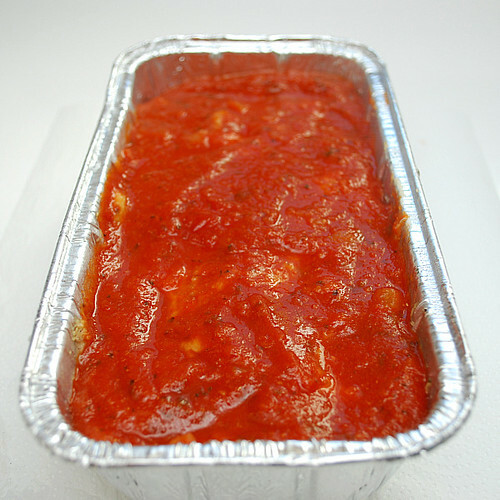 Lightly grease a loaf pans with cooking spray, set aside. In a large bowl, combine the ground chicken, egg, breadcrumbs, thyme, oregano, basil, garlic, onion, salt, pepper and Parmesan cheese. Try not to over handle the mixture otherwise it will get tough. Place the mixture in the greased loaf pans and form into mini loaves. 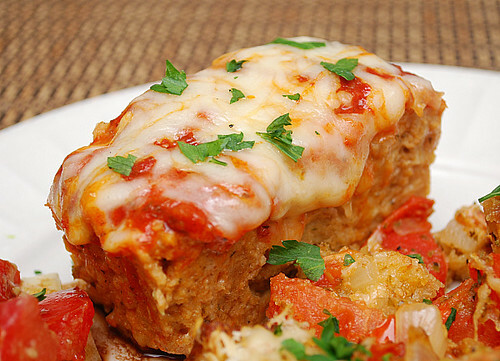 Top the meatloaves with pasta sauce. Place the loaf pans onto the trivet. When the IP beeps after pressure cooking for 15 minutes, allow your IP to naturally release pressure for 5 minutes. While naturally releasing pressure (also known as NPR or NR), the display will reflect numbers counting up from 1. The numbers indicate how many minutes the IP has stopped cooking since it beeped (or how many minutes it has been naturally releasing pressure). No need to touch your IP while it naturally releases pressure. The pin at the top of your IP will drop when all pressure has been released and it's safe to open. When the display reflects L5:00 (which is 5 minutes since the IP has beeped), turn the setting on top of your IP to VENTING. Doing so allows the IP to quickly release any remaining pressure (also known as QPR or QR). I use a wooden spoon to carefully turn the setting to avoid close contact with the potential steam. You may also want to turn your IP away from cabinets to allow the released steam to escape freely. The pin at the top of your IP will drop when all pressure has been released and it's safe to open. Remove the meatloaf pans from the IP and sprinkle the top with the remaining shredded cheese. Place the meatloaves in the preheated oven and broil until the cheese is melted. Hi! Thank you for your comment... I have the 6 quart Instant Pot. I use the disposable foil mini loaf pans and the standard size for them is 5.75"x3.25"x2"
Could you put some mixture in two loaf pans then put a trivet on top of them and add two more mini loaf pans? Would they cook evenly? How about one ring pan--- would the cook time remain the same? Those would all work well and no need to adjust the timing!